Angel has also been a joy this season - admittedly he can be a handful on his first day out after 3 weeks off due to snow, but that's just enthusiasm and utterly forgiveable. He is now a very reliable hunter and wonderful over the terrain - enormous progress from this time last year, when he had only had a few days out and was very green, and both Edward and I have had some lovely days on him. Sadly, 2010 will also be remembered as the year we lost Ghost - a perfect gentleman and an amazing ambassador for barefoot. He was a great friend and had a wonderful summer but it still seems strange not to have him here. 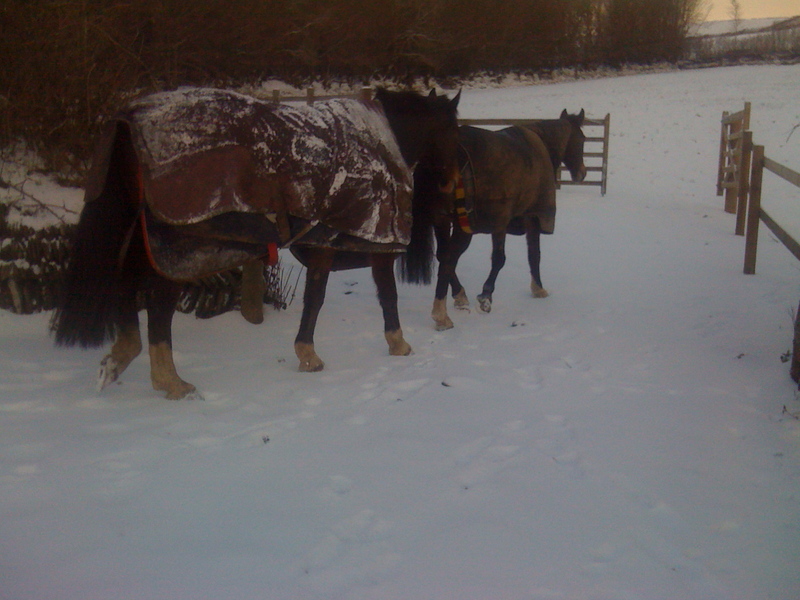 On a happier note, 2010 has been a very encouragaing year for the rehab horses. We have had more visiting us than ever before and the vast majority of the horses who have been here have gone home sound and returned to full work, and - looking at the horses here today - I am sure that is a pattern which will continue for the next year. "Bailey is going really well and we went for a 2 hour hack today and he was a dream to ride, his paces are really coming on and i can’t wait to get back into the dressage arena.lol. He just floats across the ground. His hoof pastern axis is the best it has ever looked and they look so much shorter and upright and strong." Its hard to believe that its nearly 6 months since Bailey W first arrived at Rockley - half a year gone in a flash - and it seems only yesterday that other horses who've been here this year, like Paul, Bobby and Charlie, Lexus, Lady, Storm, Rose and Frankie, were here too. Finally, and last but certainly not least, thank you to all of you - owners, clients, friends and family who've followed the blog, made comments, suggestions and given me food for thought, support and advice over the last year. Many of you have also been kind enough to give fantastic "references" for others who were thinking of sending horses down here, and I know you've also done an enormous amount online and off to support Rockley - I can't thank you enough, and a huge part of the success we have had over the last year - which has been extraordinary - has been down to you - you know who you all are, and although there are far too many of you to list by name, I hope you raise a glass to yourselves this evening, as I will to you :-) Happy New Year, everyone! Time for a proper update before New Year's Eve, and it has to be Ginger. He is a 17 yr old chestnut TB who has been here just over 3 weeks. He reminds me very much of our wonderful old boy, Ghost - he has the most delightful manners and is full of enormous enthusiasm for life. I took some new footage of him today, but it was so foggy that even in the barn with the lights on, you can hardly see him on camera, so I will have to wait for a brighter day to film. I did manage to get some photos, though, which show his hooves beginning to improve. The top photo was taken a few days after he arrived, and the lower one was taken today. As you can see, the snow hasn't stopped him starting work or making good progress with growing a better hoof. In the second photo you can see that once his new hoof capsule grows in, it will allow him a much shorter toe and a better connected hoof wall. and below, the same foot today. No dramatic change in the frog, but it is beginning to de-contract and the heels are less pinched than they were. Importantly, he is already able to work comfortably on varied surfaces and the more work he can do - in comfort - the better his hooves will become. Roll on 2011 for Ginger - the start of a renaissance for him, I am sure, and I hope it will prove to be as long and as successful as Ghost's - it is certainly as well deserved. On the plus side, its warm, its no longer necessary to chip frozen piles of poo off the track, and there may even be a chance that hunting will briefly resume before the next freeze. Happy Christmas from this blog! Happy Christmas! from Nic Barker on Vimeo. I hope you enjoy it, and thank you to all of you for making this the best year so far for the blog and for Rockley. Just in case we have another glitch with online connectivity, I'll take today's blog to wish you a very Happy Christmas, and an even better 2011! Most people have no difficulty accepting the concept that the state of a horse's feet will have an effect on the rest of his body. In practice, though, when a horse is being assessed for lameness the tendency is for the vet to try and pinpoint where the problem is coming from and often a nerve block to the foot will improve lameness so much that the diagnosis is of a foot problem. This approach is fine as far as it goes but it can overlook the other problems which have developed. Kingsley is one example: he is a young, athletic horse and is full of energy. His natural response to having foot pain is to try and find a way of carrying himself which allows him to keep moving and reduce discomfort - a perfectly normal response of course. In his case, the solution resulted in him twisting his body and throwing his legs out at strange angles with each step he took. 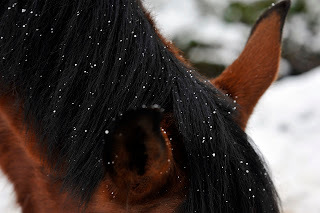 This had knock-on effects on his neck and shoulder muscles, as Wiola has documented in her blog, and also meant he was unable to trot correctly because trotting requires movement on a diagonal and therefore a loose back, which he didn't have. Other horses, perhaps those who aren't as young and flexible as Kingsley, end up with neck pain, from bracing to stabilise a weak front limb, or hind limb weakness where they have locked the back muscles to prevent the weaker front limb from too much pressure. One thing is for sure - any horse who has a leg problem for more than a short time will also have neck or back pain. Here at Rockley, the snow has been falling steadily but on Exmoor we have the big advantage that it happens to us fairly often so, as long as the forecasters have got it right, its a nuisance but it tends not to cause nearly as much trauma and chaos as it does in some parts of the country. The week before Christmas... from Nic Barker on Vimeo. With the help of Fayley and Will, who had come to see Isha, I managed yesterday to get some footage of Solomon on a circle. He wasn't entirely sure that going round on circles was a good idea, as you can see(!) and would much rather have done galloping about in the snow. Nevertheless, he agreed to give it a shot eventually. As you can see, rather like Kingsley, his work on a small circle is not 100% yet, but its enormously improved from the very unlevel movement he had when he first came. I am hoping for a very happy New Year for Solomon! Over the years, owners have become more and more switched on about how profoundly diet and environment affect hooves. 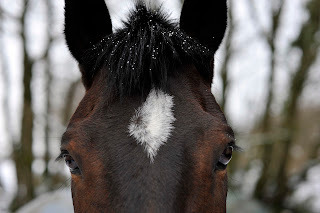 Thats a good thing, naturally, but it can sometimes seem that keeping horses barefoot requires new and different facilities, which makes it a rather intimidating option, especially if you are on a livery yard or have very basic accommodation for them. One of the questions I am most regularly asked by concerned owners whose horses have done well at Rockley is how on earth their horses will manage once they go home. The answer is that usually they do very well, although sometimes a few changes and tweaks are needed to how the horses are managed. Rockley is set up for rehab, but once horses have healthy hooves, they are able to cope with lots of different environments extremely well provided that you respect the golden rules - a great diet, lots of movement and plenty of varied surfaces during exercise. A common complaint is that people at home or on a livery yard have very limited options as to how they keep their horses, but the secret isn't having the best facilities, its making the best out of what you have. Recently, Andy decided that he was moving out - not him personally, you understand, but his horses :-) We were running out of space in the top barn and he wanted the horsey male's equivalent of his own shed at the bottom of the garden, where he and his ponies could be peaceful and do exactly as they pleased most nights of the week. Building another barn and track system was obviously out of the question, but there was already a field shelter in the lower yard - it was somewhere we have used in the past for cows in the winter and although it didn't have any mod cons the building was sound and the yard wasn't too muddy. It didn't take much to create a great environment for the horses - a couple of gates on the front of the shed means they can be shut in or out if need be - though they usually are free to come and go as they like - enough feeders to allow for variety and for haylage to be fed in the dry in bad weather and last but not least an off-cut of membrane and a couple of tons of pea gravel to make a comfortable "lounging" area for them. It doesn't break the bank and it probably cost less to lay the gravel than it would to provide shavings beds in boxes every day - in fact the gravel area means they rarely want to go inside so their bedding last ages! In summer they will have a grass-free area with shade and shelter and although its not huge, it allows more movement than in a stable; combined with regular exercise and turn-out, it suits the horses and their hooves extremely well. I hope it goes to show that you can create a very nice "barefoot-friendly"set-up without going to huge expense, needing lots of space or having to plan a complicated track system. The reason for this post is a comment which was made to me a long time ago by an owner who had a nice showjumper which had been diagnosed with navicular. She wanted me to look at the feet and give her some advice and was prepared to put lots of effort into helping the horse improve. As is often the case, the horse had a very weak, under-developed caudal hoof but there were lots of good points about the feet as well and the owner was fortunate enough to have great facilities with lots of different surfaces which she could work the horse on. After listening to me describe the sort of work and exercise level which I thought would benefit the horse, the owner sighed and said "I'm not prepared to work a horse which isn't sound". I explained that the weak areas of the hoof would only become stronger with work, and that all work should be within the horse's comfort zone; I reassured her that she would not be pushing a horse to work on surfaces or at speeds which she couldn't cope with, but she was adamant. As a result, of course, the horse never improved. 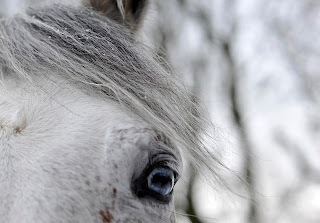 I think there is sometimes a tendency to look at soundness as an absolute - a horse is either sound or it isn't - but the reality of course is that soundness is not black and white. We've all come across horses who start off a bit stiff but loosen up beautifully once they are moving. 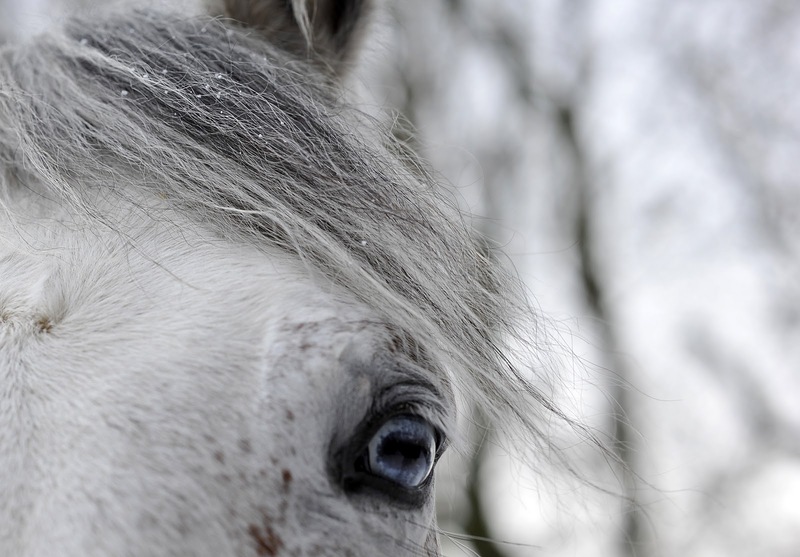 In the same way, the rehab horses who come here are far from sound when they arrive. If I, or their owners, refused to do anything with them until they were perfectly sound we would be waiting a long time, because in fact the improvements in soundness which we see are a direct result of correct, comfortable movement. Its a virtuous circle - the more a horse is able to move correctly, the better his hooves become, the better his hooves become, the more he is able to move correctly. There is a saying among classical trainers that, with any piece of training, you are either improving a horse or damaging a horse. You can say with equal truth that with every step a horse takes, he is either strengthening or weakening his body. Just as with training a horse, building soundness (or creating lameness, for that matter) is not something that happens in a day - its a gradual, cumulative process consisting of many small movements. At the risk of being boringly predictable(! ), I am delighted with her progress as well. Her landing has improved and grown much more confident and in just a few short weeks she has gone from a toe first landing on three feet to a heel first landing on all four. She has done a mixture of work, in hand and under saddle, and has shown excellent manners despite her unbounded enthusiasm for being out and about :-) She is weak behind because of her prolonged period of box rest, but she is starting to build up again, thanks to work and hills - good job she is enthusiastic! As you might have guessed, with it being Kingsley's turn yesterday it is Solomon's today, and whilst I don't have footage of him on a circle (sorry, Lucie, I will try to get that soon! ), I do have updated footage of him landing. He has gone from having a toe first landing to a consistent heel first landing and I am particularly pleased with how his heels and frogs have improved. When he arrived he had contracted heels and weedy little frogs and he had also developed a split in the central sulcus of his left (which was his worse) front. He now has a much stronger caudal hoof and I am very pleased with how well he is progressing. Last week when Wiola and Pauline were here we were unable to use the arena because it was frozen solid, so the only footage I was able to take was "out and about". However, I had been working Kingsley in hand quite regularly up till the freeze, because he had a major problem with trotting and circles. Kingsley on arrival, in his wedged shoes. He is now considerably hairier but also considerably sounder! As Wiola wrote in her blog in August, when he first came down here he was physically unable to trot a circle. On the lunge he would try a strange running walk - or "bunny hops", as Wiola described it - if you asked him to trot he simply couldn't, because he was unable to use diagonal pairs of legs at all. He was bad on the left rein and even worse on the right rein. After nerve blocks in August he was better but not sound and on x-ray he had also deteriorated. At this stage his prognosis was very gloomy indeed. When you look at this early footage of him walking, its easy to see why he couldn't trot - his back and spine were twisted to the right and he had developed a hollow, kinked way of going which made bending, and particularly a smooth trot sequence, impossible. Kingsley is a perfect example of why any rehabilitation worth its salt needs to look at the whole horse, not just the feet; conversely, any schooling can only be successful once feet and limbs are sound and healthy. As Kingsley's hooves have begun to improve so has his way of carrying himself but he had also got into a habit of being crooked and it took some intensive re-education before he realised that there was an easier, more comfortable way of moving. The time that Patrice Edwards spent down here in October was enormously helpful and she taught both Kingsley and I some invaluable rehabilitation exercises. Since then we have been able to gradually do more and more, and finally yesterday, in an only slightly frozen arena (if you look at the ground you will see there is very little give :-0 ...), I managed to get some footage - thanks to Sam for filming! Rather belatedly, I have finally managed to get footage of Ginger, our latest arrival who has now been here a week. Unfortunately I couldn't do it the day he arrived because it was already dark, and for the rest of the week there was a distinct shortage of spare pairs of hands to hold camcorders(!). As you can probably see, he has an intermittent toe first/heel first landing on his RF and a better landing on his LF. On a circle (which I haven't had the chance to film yet but hope to at the end of the week) he is very unlevel. Considering how weak his caudal hoof is (his photos are here), his landing could be an awful lot worse - I suspect he is one of these tough old horses, just like Ghost and Lexus, who keep on trucking despite dodgy hooves, until finally one day things catch up with them. I am very hopeful though that his feet will improve rapidly and with it his comfort levels. Thanks so much to all if you who got in touch following Dad's accident - the online community is a remarkable thing, really - much more real than virtual. I went to see him last night and he is very cheerful and looking forward to getting mobile again :-) I am sure he will not let it slow him down for long! "Ah, Ginger, my dear fellow, help yourself to a bit of snow-cone..."
"Thank you Solomon, I don't mind if I do." 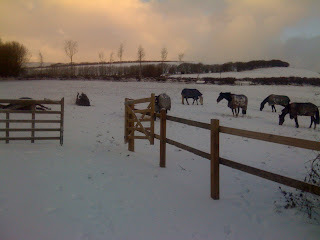 The good news is the horses are fine, the ice is thawing, and I've had a brilliant email from Lady's owners. They have had quite a struggle with grass over the summer and have worked incredibly hard to create an environment which allows her as much movement as possible without too much sugar(!) - I've posted about her woodland track here. This week they took her to be re-assessed by her vet, as an insurance requirement. The assessment involved her being lunged in the car park, as the arena was frozen, and they were all thrilled with how well she behaved and moved - she's good to go - even more! The bad news is totally non-horse-related, but a shock nonetheless, as my Dad was hit by a car yesterday (on a crossing) and is in hospital with a broken leg, which they are apparently hoping to screw back together on Saturday :-( I'm zooming up to Bristol some time today to see him, but its not the best pre-Christmas present for any of us...and for him and Mum least of all, of course. However, I am hoping that over the weekend I will have the time to put together some posts on whole horse rehab, which I've been wanting to put up for ages. Jen J has also asked about still photos of toe first/heel first landings which I have, but haven't put on the blog before, so thats something else to try and organise plus of course new footage of the rehab horses is long overdue and again the weekend should bring spare pairs of hands so I can finally get that done...(!). ...arrived on Monday evening but he is such a thoroughly chilled out chap that already he is out with Felix, Charlie and Isha and he looks as if he has been here at least a month - although snow is apparently a novelty! Ginger seems to be one of those easy horses who just gets on with everyone, and all the other horses seem to like him as well - he has clearly been there, done that, got the T-shirt, and so a move to a new yard with a new herd of horses is just another interesting development, an intriguing change but certainly nothing to worry about. He and Felix just strolled off together when I first turned them out - and you can rely on Felix to recognise a thoroughly nice, dependable fellow when he meets one :-) Charlie agrees, as you can see from the photo - normally, Charlie isn't happy to stay with new horses unless he is also with a "responsible adult" like Felix who can make sure things are going to be all right. If he is hanging out with Ginger, then it must be because Ginger has everything under control - phew, what a relief, Charlie! Isha of course has the hots for Ginger (not least because he is new(!) - as Fayley predicted), which put Angel's nose out of joint slightly, but then Angel is used to the fact that no-one takes him seriously and is already looking resigned... He will no doubt be the next member of the Ginger fan club! I've been wanting to talk about box-rest for a while - there was snow much other stuff going on last week that I put it on hold, but anyway, here it is now(!). The fact is that many of the horses who come here have been put on box rest in an attempt to improve their lameness. Of course for some horses, box rest is successful but the ones who come here are the ones for whom it hasn't worked. I can see why vets may feel clinically obliged to put these horses on box rest, because they tend to become lamer the more they move. Frankie, Bailey W, Solomon and Isha were all classic examples of horses who became much worse even if they were only turned out in small fields so working them was out of the question. Logically, you would think that box rest would be a solution but there are some fairly obvious pros and cons with box rest. The only pro is that it stops horses from moving and therefore doing more damage. 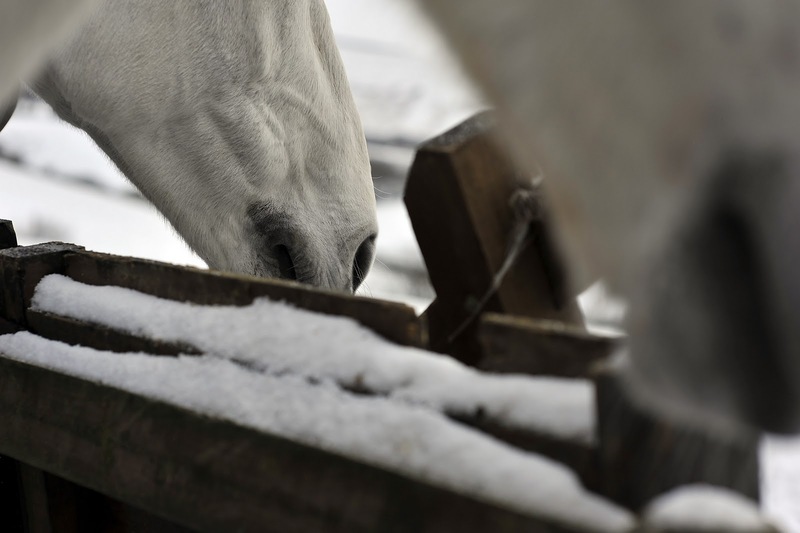 last but certainly not least, box rest can be extremely stressful for horses, many of whom fret with the lack of movement and contact with other horses. Personally, I've never found box rest terribly useful. Many of the horses who come here have a lameness which is made worse by movement but the answer isn't to stop horses moving - much better to enable them to move correctly - once that happens then suddenly more movement isn't a problem any more, but in fact it becomes beneficial. To take some examples - Bailey W, Frankie, Solomon and Isha all arrived landing toe-first. The more they move like that, the more they are stressing the tendons and ligaments within the hoof, and the more likely they are to injure himself. In those circumstances, even a short canter across a field can result in another soft tissue injury and more lameness. However, once you can strengthen the hoof and turn a toe first landing into a heel first landing - then movement is no longer a danger, its actually a part of the healing process. "[Prof Denoix] was talking about the rehabilitation of tendon lesions, and the fact that you need to rest the injury without resting the horse. Of course that is precisely what we try to do here - movement within comfort zones is an essential part of our rehabilitation programme. A traditionalist [who had been insisting that horses in the UK routinely required box rest for tendon injuries, and who was obviously perturbed that it wasn't used in France!] asked him when he recommended box rest. He thought about it for a moment, and said he would of course immobilise a horse which had a fractured limb(!) but other than that, he preferred to keep horses moving. As he said: "French horses don't like being kept in boxes." ;-)"
It was an interesting day yesterday. It was beautiful, sunny - and about minus 6 degrees most of the time. Pauline and Wiola were coming down to see Kingsley, and because the road in is still blocked by drifting snow I gave them some alternative directions...but they got lost...very lost. Not helped by SatNav, which didn't realise that its preferred route was several feet under snow and had an impassable icy gradient to contend with as well...Wiola's photos are here! Eventually we were back at Rockley and they could do what they had come for - to see Kingsley and check how he was doing. Just before we managed that, we had another interruption as Barney the dog disgraced himself, as he often does, by rifling through Pauline's bag and stealing all the scrumptious food she had brought along - cream cakes, iced buns and several pieces of quality M&S shortbread disappeared along with her sandwiches. Barney is now very fat, slightly incontinent and did not have supper last night. We decided just to take the horses out exercising because there was no chance to use the school, unfotunately, as its frozen solid; even so we were limited to being able to go on fields and tracks where the sun had thawed the ground slightly. Kingsley has now been here 2 months and it was fantastic to hear that Pauline and Wiola also think he is making good progress. He still has a way to go but they both felt he was stronger, more even and using himself more correctly. I certainly think he has improved enormously, from being a horse who had no idea where his feet were, and who was completely unable to trot even in a straight line and even without a rider. Another positive yesterday was the arrival of new boy, Ginger, who came all the way from Lancashire. He is an absolute gentleman who arrived too late yesterday for me to get footage of him in daylight - but there will be lots more about him shortly. On the Horse and Hound forum there is yet more discussion about barefoot and more unease about the barefoot bogeymen. I've only had a quick read through but the first point to make is thats its great to read the posts by the "barefooters" (particularly Cristina, Caroline and Bruce, though there are other good comments by people I don't know) which stand out as clear, factual and forthright despite some inflammatory and hostile provocation. I admire your patience, humour, honesty and persistence and everyone who has barefoot horses or is interested in having barefoot as an option available to them should be grateful to you! "My second hope is that some day soon Nic Barker is asked to be an expert witness in a case of Mrs Heartbroken vs Mr Closedmind MRCVS seeking compensation for the unnecessary death of her horse with "incurable" DDFT foot lameness. THAT'll focus people's minds!" "I have a horse with suspected DDFT lesions and navicular damage and I'm thinking of having his feet chopped back and the most humungous wedge bar-shoes put on that my farrier recommended, but before I do can anyone tell me if there are published papers backed up by MRI scans, before and after of course, of every horse that has been treated during the study and showing a 100% success rate? Until then I will leave him barefoot becuase he actually has been sound these past 24 months and rampaging around the countryside at all paces. Of course - I don't know if he is sound becuase I have not done MRI scans to prove he is sound - but he looks sound to me and to my vet." The second, more serious point, is for all the people out there who are asking for pre and post MRIs before they want to take barefoot seriously. The fact is that conventional treatments aren't supported by research to this standard either. There is not a single research project out there (including the published research which I mentioned here) which has done this. The standard treatments - including remedial farriery, anti-inflammatories and box rest - are supported by research based only on so-called "anecdotal" evidence - responses by owners to follow-up questionnaires and telephone surveys. The horses have not even be re-assessed by the original vets. Add to that the fact that the research shows NOT that the horses mostly improved after standard treatment but that mostly they DIDN'T - and is it any wonder that owners have felt frustrated and looked for alternatives? It was lovely, though, to speak last week to the vet of the latest horse to be coming down here. She was extremely positive right from the off about sending the horse here and thought that using different surfaces to make him more comfortable was a good idea and possibly just what he needed :-) Incidentally, that horse is coming down due to to the information available on the Horse and Hound forum - so well done and thank you again to all who have taken the time to inform people there. However, there is still a lot of scepticism and downright vitriol online as well, and there is undoubtedly honest concern about the "barefoot bogeymen", which I can sympathise with. I think that we would all like there to be full regulation for barefoot, as there is for farriery, and for the weekend trimming courses to be banned - though there would still be good, bad and indifferent hoofcare out there, just as there are good, bad and indifferent farriers at the moment. Everyone would like a huge research fund which can use the "gold standard" of MRI before and after to assess therapies (though if people want to go against something, they always will, with or without research - many people don't make decisions on the basis of logic!). Everyone (particularly me!) would like there to be a hugely wealthy "barefoot movement" which was able to fund stuff and influence people, as opposed to the reality, which is that UKNHCP scrabbles around and relies mostly on people doing things on a voluntary basis, in their spare time and on a shoestring(!). ...though Ted's yesterday were pretty good given that he was hampered by a puppy on a lead...! Winter day from Nic Barker on Vimeo. ...and now Isha's got the hang of it as well! "We are NOT getting left behind - the girls may be big but we're smaller, nimbler and faster..."
"Look, I can even do trotting!" We both walked all the way home - again.